We'll celebrating Krampus in July! 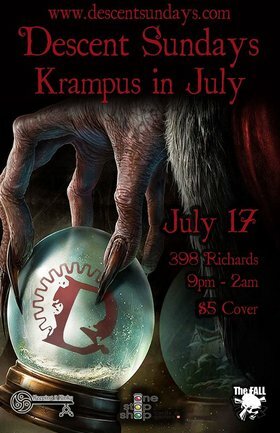 Who is Krampus you ask? He is a large half goat, half demon creature bearing large horns and fangs. He journeys with St. Nicholas to punish all those who have been naughty or not keeping with the spirit of the holiday. If you have been naughty, you might want to keep an ear out for the jingle of his bells that he will use to beat you into submission... The year is already half over so now is a great time to consider the track we are on and to pay homage to the dark harbinger of the holidays. Make up for all the naughty things you've done this year already by participating in a fundraiser for the community. The Descent Team will be collecting donations of socks, canned and/or non-perishable food items, and cash. We will also be hosting a 50/50 draw and silent auction. All proceeds will be donated to resources in our community that help those in need. We encourage everyone to make their sacrifice to Krampus and get off the naughty list!